Since I decided to move from Canon EOS 5D to Canon EOS 1D Mark III I needed a new normal lens since I could no longer use my Leica Summicron-R 50mm f/2.0 as my normal lens since it's field of view on 1.3x crop is same as 65mm lens on full frame, a little long for my taste. 35mm field of view in 1.3x crop is same as 46mm lens would be on fullframe, therefore this lens is my normal lens on 1.3x crop format. Most important aspect of normal lens (to me) is that it produces neutral perspective. With this lens I use perspective as main element to create the 3d feeling to images I take with, and typically it also needs help from well controlled bokeh, not too blurry and not too sharp and not distractive. Naturally this lens is also used to all kind of landscape photography. Then I need all the sharpness and microcontrast I can get out from the lens, and this lens delivers! 2008-03-01: In order to give final verdict more photographs are needed to be taken. This section is under construction. Aperture is can be selected 1/2 stop intervals. When using viewfinder and manually stopping down it's easy to calculate "clicks" from wide open to determine the aperture into which lens is stopped down. Only problem with setting aperture is that the lens barrel is quite wide (wider than aperture ring) and aperture ring is between lens barrel and camera and in some situations it wasn't easy to adjust aperture, specially with gloves. Lens hood protects front lens element quite well physically, but not from sun and other light sources. This lens would definitely benefit from scalloped hood. Zeiss lens caps are not very good to operate and I have replaced them with Nikon lens caps with have better design. Circular polarizer is easy to operate even when the hood is attached to the lens. However the hood does not protect the filter much from the sun and other light sources. Build quality is as good as I could imagine, from different planet than Canon lenses. Lens hood has bajonet and lens hood is made of metal, not plastic. Lens hood fits very well to lens and can be reversed. 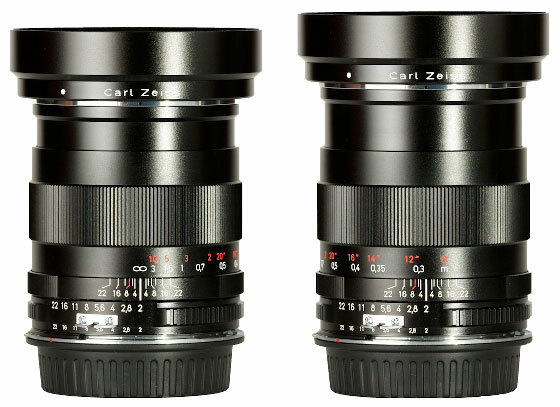 Lens dimensions with Nikon to EOS adapter and lens caps are: diameter 65mm, length 115mm, weight 565g. Dimensions when including hood: diameter 82mm, length 162mm and weight 590g. This lens isn't internal focusing and therefore extends when focused closer. 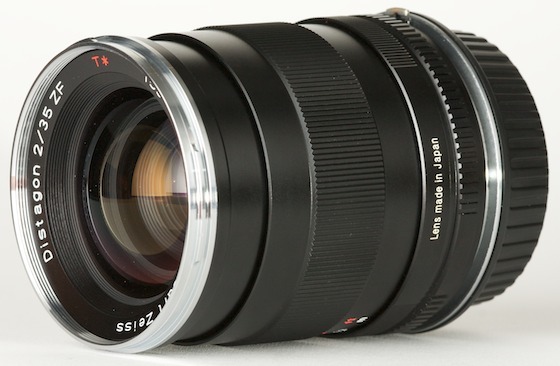 Lens extends about 5mm when focused to minimum focus distance 0.3m. Lens uses filter size of 58mm. Minimum aperture is f/22. Aperture has 9 blades and aperture remains very round even at f/22. Lens has 9 elements which are in 7 groups. Actual focal length is 35mm. Minimum focus distance is 0.3m, which results 1:5.4 (0.18x) magnification and full frame (36mm x 24mm) coverage of 196mm x 129mm. 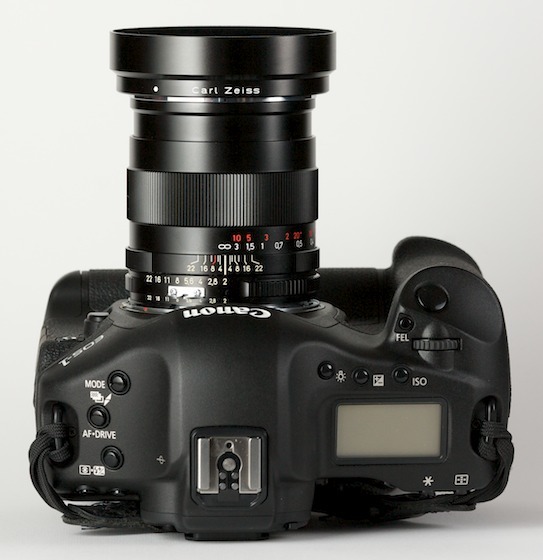 Distance from EOS lens mount (including adapter) to end of the hood is 91mm at infinity and 96mm at minimum focus distance.